Although the good news that I heard yesterday wasn't the good news that I've waiting for, it was still a great good news. What's the great news? Well it just happens that our mortgage specialist has told us yesterday that we pre-qualify for a mortgage of $500,000. Well the actual amount would be lesser but we're hoping that it would be enough for the house we absolutely live at $470,000. Anyway, since we're on a tight budget we are looking for great deals on furnitures and decorative pieces. We don't have the approved amount but it doesn't hurt to save time by window shopping. And the first thing that I thought of are bathroom vanities. 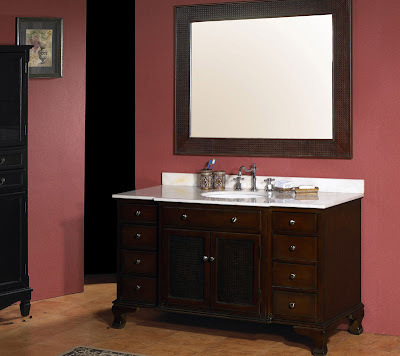 Look at this 53" Classic Bathroom Vanity! It's so beautiful! And it doesn't cost that much too as it only values at $1,195.00 with the original price at $2495.00! I'm quite impressed by the wide variety of vanities by this online merchant! They offer 0% Financing and free shipping plus their prices are awesome! I've been looking at the double vanity which I'm thinking of placing on the second floor of our house-to-be. I'm definitely going to show this to my mom because if we are able to save that much on bathroom vanity alone, we could still have enough to make our future home our dream home.